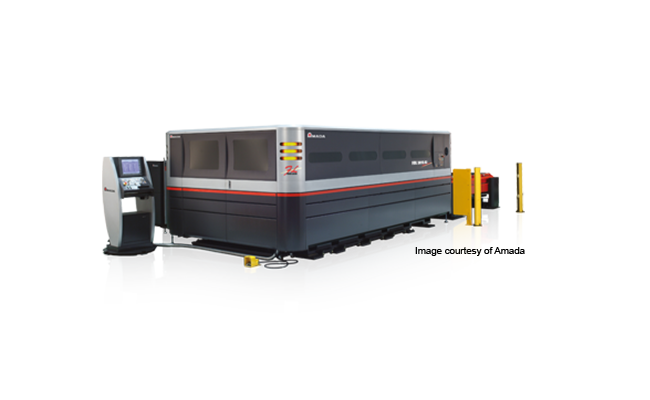 Amada's FOL-3015 AJ NT laser cutting machine has a fiber laser that can cut through materials as tough as titanium, brass, and copper. This sheet metal CNC machine comes in two versions: a 2kW and a 4kW. The specifications below are for the 2kW version with the only difference with the 4kW laser machine is the Oscillator is an AJ-4000 and it's a little heavier at 16,400 kg. The FOL AJ NT series features a laser beam that has a wavelength of about 10% of a conventional gas laser. The travel speed of the laser has a great level of satisfactory performance. An instance is that it can cut one millimeter thick stainless stell metal at an astonishing 60 meters per minute. The fiber laser technology has a low energy requirement which in standby mode and does not need to warm up. It also reduces emissions because the fiber laser does not need CO2 while operating. If you select this laser machine, an excellent companion to it is SMP, a CAD/CAM software for sheet metal from Merry Mechanization. SMP provides optimized NC code for thousands of laser machines like this one. Specifications may vary. Manufacturers reserve the right to change the specs at any time without notice.